[Question]-So is that it? DB820C is dead? Product page no longer says that the part isn’t available for ordering. Now its gone completely to 404. Apologies for the 404 link - we are working on an updated version of original 820c 96Boards which will be available soon. Please stay tuned. If so, are any special provisions being made to actually get it in stock in a reasonable time and keep it in stock? The 820c was a complete disappointment in terms of availability. It was late shipping (over a year), didn’t stay in stock, and was only restocked a couple of times. Is this “updated” version the 845c that I see listed as a channel name in 96boards discuss? No, I am responsible for 96Boards in Linaro. You are right - 820c has had many issues in terms of availability for reasons out of our ability to influence. We are actively working with 96Boards partners for a re-launch of the board with general availability to fix in mind. There is no excuse - we are sorry about the situation of this product and we will fix this. Upcoming 820c is different to 845c product. Please stay tuned for the launch of board product. Is there any indication of timelines for availability of the updated 820c and the 845c? 845c is likely to be very soon - to be followed by 820c upgrade design. So are we looking at weeks? Months? Can you provide any details on the 845, like form factor? Is it a regular CE? Or is it extended? Are they still being built by Arrow or will somebody else be taking over? Sorry, I really can’t disclose more at this point - all I can say is we are looking at weeks, not months. Is there anything more you can tell about this board yet? Really anxious to see a high end board with a qualcomm. Will that board be made available without the robotics kit? I don’t see much use for the rest of the parts, at least for my own purposes. And how tall is that ethernet port? I think the CE specs have a limit of ~7mm? Something we are still working on. Unfortunately I can not give you a definitively time at this point. the design of the mounting option makes it not interfering with mezzanine and within range - the exact height I will take a measurement later. @Loic shared a picture of it from the side, and it definitely will interfere with any mezzanine that covers the area of the board with the ethernet plug, which at this point, looks like all available mezzanine’s listed on 96boards.org, including the UART mezzanine. In fact, the robotics mezzanine that the kit includes has a cutout to go around the ethernet plug. The presence of that ethernet port on the top of the board where it is, is a very unfortunate design decision, since it will necessitate the use of a spacer board. It would be much better if it were on the bottom of the board, or some kind of dongle. To be honest, with USB 3.0, I don’t see a particularly great need for the board to include ethernet. Its nice, but not worth the tradeoffs, at least not on a standard footprint CE. Or even with a little bit of brutality, one of the $5 audio mezzanine’s could be turned into a spacer. I am not sure I follow - please take a look at the measurement here. 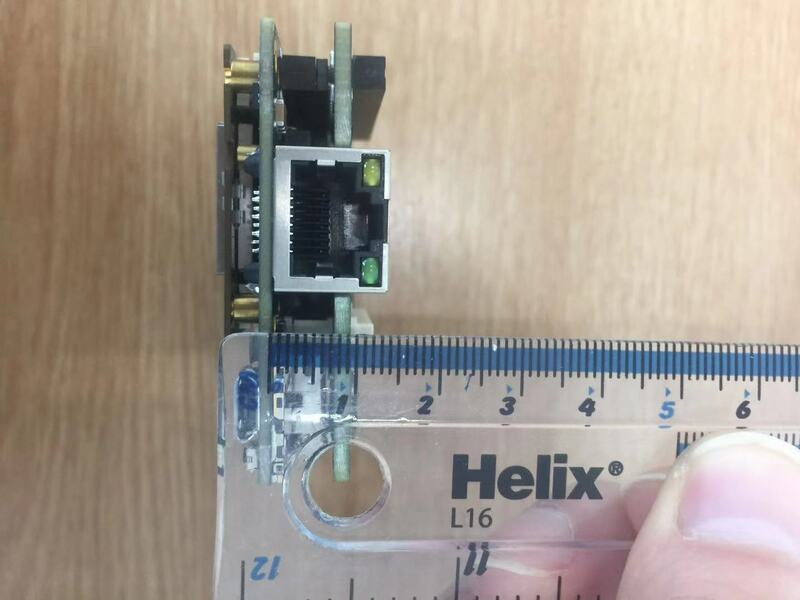 Your ruler is clearly showing it at 13 mm (9 mm taller than allowances) and clearly shows that the mezzanine that is attached has a hole cut through it to fit around the ethernet port. If you replace that mezzanine with any other, it will not fit. Ok I see your point now. You are right. We will have to have this mezzanine as convertor.